CM: This Aero Circus was made in 1931 in Iowa by Newton Manufacturing Company. 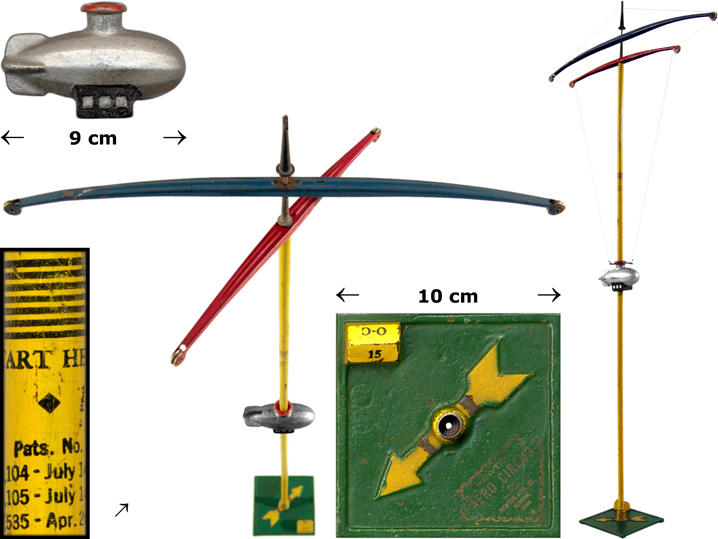 The Aero Circus comprises of a green painted cast iron base, including yellow directional arrow and model house in relief; a yellow sheet metal upright tube; a couple of sheet metal pulleyed arms, one in blue (40cm) and the other in red (27cm); and a miniature zeppelin suspended on the tube from the arms by means of fishline. To activate the Aero Circus one must wind the arms around the conical finial, so that the zeppelin reaches the 'START HERE' point on the tube. As soons as the arms are released the zeppelin unwinds downwards thanks to gravity. In its simplicity, it is fascinating to discover that Aero Circus was such a widespread form of entertainment in the United States during the interwar period.